When she was found, unconscious and bloody in the front seat of an abandoned car in the middle of the woods, she had a shilling in her pocket. The shilling was found in the pocket of the blue pea coat she wore—a bit worn about the edges, old, with no maker’s label and the faint whiff of camphor about it. The rest of her clothes—t-shirt and jeans, simple espadrilles—were the same: well-kept but old, no labels and no sign of identification. Thus begins one of my completed WIPs (works in progress). The manuscript isn't ready to be shared with the world, but it is something I've worked on sedulously over the last few years (part of it set in 2015, which was the "present" when I wrote it!). It's undergone major overhauls and a complete rewrite. Finally, it's in a form I deem to be acceptable. It needs a polish, but eventually I will enlist the help of beta readers. Unfortunately, "real life" is keeping me busy at the moment. The point is that the shilling that's mentioned in the opening line, while not integral to the plot, plays a part in the story--largely a symbolic one. It adds a touch of mystery: the setting is Pennsylvania and the "she" in question is a young woman who wakes from a coma with no knowledge of who she is or how she came to be in that car. The rest of the WIP is about her discovering the answers to why she was where she was, where the shilling came from, and why it's from 1913 (the date is later specified). Me being me, I wanted a little memento. I enjoy making artwork or wearing jewelry that has some connection to my writing. In this case, the "she" of this story is alternately called Wendy and Alice. I have a bracelet with an illustration and quote from Alice in Wonderland, and I painted a small picture based on one of the original Alice illustrations. I plan to work on a Peter Pan-themed one, too, when I get a chance. 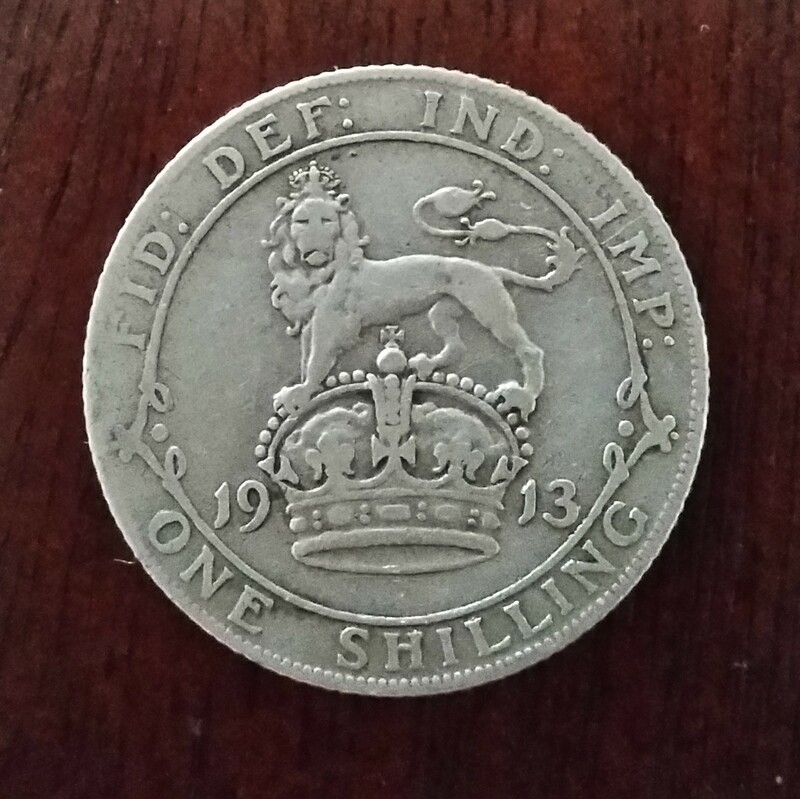 In any case, it occurred to me that a 1913 shilling is an actual object that exists and I might be able to get my grubby little hands on one. So I searched eBay, and lo and behold: 1913 shillings for $10. I'm hardly rich, but I figured I could afford that. So I bough it, and now I have my shilling and, well, I'm chuffed! 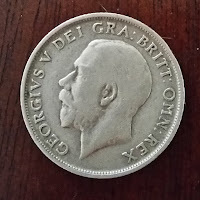 On the left is the profile of George V. The inscription is Latin for "George V, by the grace of god ("dei gra[tia]") King of Great Britain (Britt[annia] Omn[ia] Rex])". 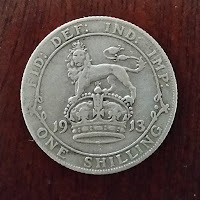 On the other side is the year, the denomination, and another Latin inscription meaning "defender of the faith" ("fid[ei] def[ensor]") and "emperor of India" ("Ind[iae] Imp[erator]").